Three senior Government officers have officially signed their contracts despite taking up office in 2015 and 2016 respectively. The Government House yesterday morning hosted the signing ceremony for Police Commissioner Gari Baki, Deputy Chief Censor Jim Abani and Second Legislative Council Marleen Toliman Akop. 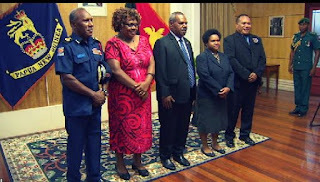 Despite not signing their contracts when they took up the jobs two to three years ago, they have been proudly serving the country in their respective capacities. For Police Commissioner Gari Baki, he was called back to the office by the National Executive Council in 2015 for a term of 4 years. “We’ve come out with so many challenges,” said Baki. “2015 was a year of a lot of instability. Internal issues challenging the police force, we’ve come out of it. “We’ve taken the country to the elections in 2017, we’ve come out of it and now we’re going into APEC. Deputy Chief Censor Abani has served the country as a public servant for over 20 years and is happy to serve for a few more years. This is his second term in the Office of the Deputy Chief Censor. He was reappointed in 2016. “What we do in our office is a mammoth task. Our primary role is to classify films and publications, either produced locally or internationally. Second Legislative Council Akop is the first female to be appointed to this job in 2016. This mother of 8 juggles family life and a challenging career very well. “I am very proud to be a public servant to serve the people of Papua New Guinea,” she said.